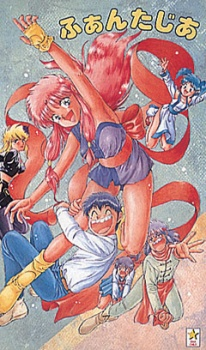 Watch Girl from Phantasia full episodes online English Sub. Synopsis: Akihiro is a teenaged boy with fantasies. He’s about to have date with his girlfriend Miyuki when he finds a strange carpet on his way home. Home, a pretty and over-energetic girl named Malon appears from the carpet. She tells Akihiro about the world of Phantasia and wants to live with Akihiro. But even if Akihiro loves pretty girls, he becomes angry with Malon’s magical powers and drives her away. The maniac wizard, Roll, who wants to kill Malon, doesn’t help at all.